On Saturday we did a thing we should not have done. We went to the Toys R Us in Times Square. If you live in New York, if you've ever visited New York, or if you have even a smidgen of sense you are wondering what might be wrong with us. "Don't go to the Toys R Us in Times Square on a Saturday, especially on a Saturday a few weeks before Christmas" is right up there in the Most Obvious Advice Category, right after "Don't do a Google Image Search for 'syphilis.'" The answer is, I have no answer for you. We took leave of our senses. We were in the neighborhood, we were already suffering, and Saturday being the first day of Hanukkah, we thought we'd get a little something for Henry because usually I get him something and I forgot. We thought "How bad could it be, really?" and we shared that thought with one another, and the response that came back to us was not "Worse than you can possibly imagine in your worst nightmares." 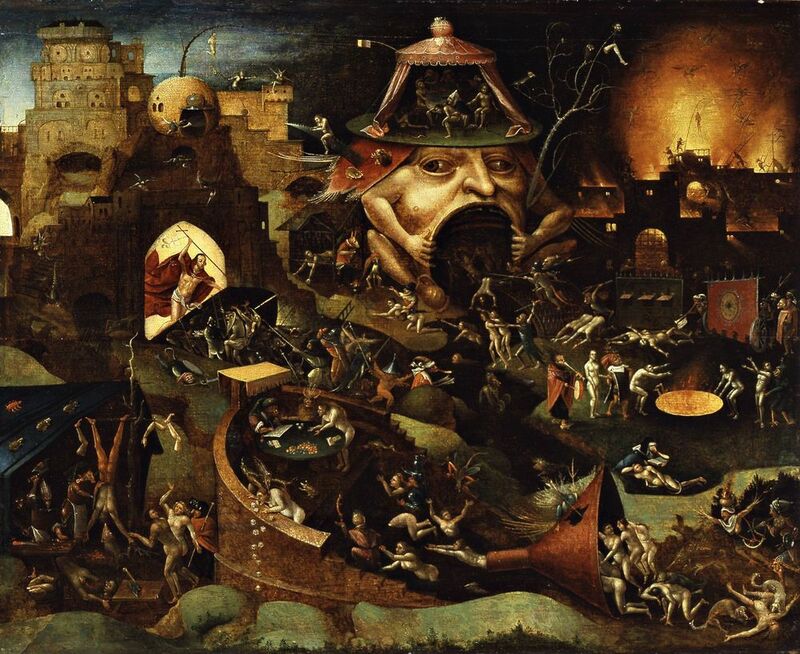 It was not "Hieronymus Bosch-like levels of horrible." Like this, only waaaay more crowded. Even Henry, who was pretty amped up about getting a Hanukkah gift, was like, "Mother? Father? We are leaving here and never returning." Unfortunately we had already entered, and were trapped in a sea of people. You can't paddle upstream, when it's people. You somehow find yourself on the up escalator, wondering if they really need to have the enormous animatronic T-Rex blasting and lurching like it's going to eat us and making the kids scream and you know what? I'm not writing about this anymore. It was horrible! The end! The good news is we got out. And also we never have to go there ever again. But seriously, Toys R Us? You are not allowed to let your stores exceed maximum capacity. You are lucky no one was injured. Or maybe they were, and you stuffed them in your T-Rex? Either way, you are worse than terrible. Let's forget all about Toys R Us. Let's watch Maymo, shall we? Hi Maymo! Maymo always helps. And never hurts. Maymo is un-terrible. What else? Well, my friends! WELL! I've got the second round of A Practice of Writing coming up, beginning January 14th. (Those of you paying attention will note that I changed the date from December 31st. Who starts a class on New Year's Eve? Honestly.) I will be opening registration this week. Get ready.